The introduction of hydrogen fueling infrastructure to the public is indispensable in a society in which hydrogen-driven vehicles including fuel cell vehicles (FCVs) are commonly used. To introduce hydrogen fueling infrastructure, such as hydrogen station (H2 station) to the society, public acceptance is a key, because people may keep a negative image and be anxious about accidents, such as hydrogen explosions caused by a leak of hydrogen. We assess risk caused by operation of H2 station quantitatively, considering combustion and explosion characteristics of hydrogen and probability of leakage or accident. We assess benefit of hydrogen use and finally these risk and benefit will be assessed by an integrated index, such as loss (gain) of life-years. We conduct risk perception survey on introduction of H2 stations. The outcome of this project will be summarized as a risk/benefit assessment report and will facilitate risk communication between energy supplier and public including people who will live around H2 stations. Recently, indoor exposure assessment tools from consumer products have been developed for the use of government and industry. However, there are no available exposure assessment tools in the world to estimate the oral exposure of chemicals from house dust. Therefore, we are now conducting material flow analysis to estimate indoor flow and stock of chemicals, especially plasticizers, flame retardants and pigments, developing an appropriate method to measure the rate of diffusion of chemicals directly into house dust and preparing an equation of diffusion into house dust. We will contribute to the development of a new indoor exposure assessment tool which is an advanced indoor exposure assessment tool (iAIR), and we support the risk management of consumer products by government and industry. There are numerous compounds in commercial and industrial products and in the environment. In the current risk assessment of chemicals, each compound has been evaluated individually. Therefore, adverse effects by exposure to multiple compounds have been less considered in the assessment. Our group aims to develop a framework to assess an exposure to complex mixtures and its risk, using state-of-the-art technology. In this challenge, the method to group compounds and estimate their physico-chemical properties based on multi-separation techniques will be developed. This methodology will be the basis of a risk assessment toward complex mixtures as a next-generation method. 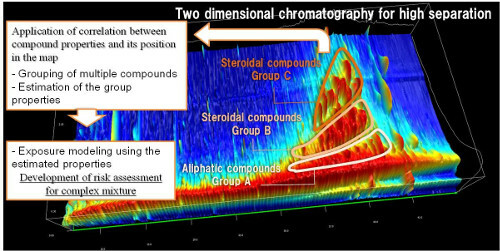 By using combination of two different polarities of columns, 2D map, which exhibits compounds with similar properties in the close region, is obtained. A new evaluation framework for complex mixtures will be developed, applying this kind of technologies. Manufactured nanomaterials such as carbon nanotubes (CNTs) are novel materials, therefore demand has arisen for assessments of its safety and its proper safety management. We are responding to this situation by promoting the development of methods to understand the exposure situation of nanomaterials, focusing on the inhalation of nanomaterials. We are developing methods and techniques to measure and evaluate released nanomaterials and conducting surveys of fields in which nanomaterials are handled and simulated emission tests. So far we have published “Risk assessment of manufactured nanomaterials”, “Emission and exposure assessment of manufactured nanomaterials”, and “Guide to measuring airborne CNTs” to support safety management by businesses. Conducting ecological risk assessment of chemicals is a complicated and troublesome task because it requires a great deal of time and advanced expertise. 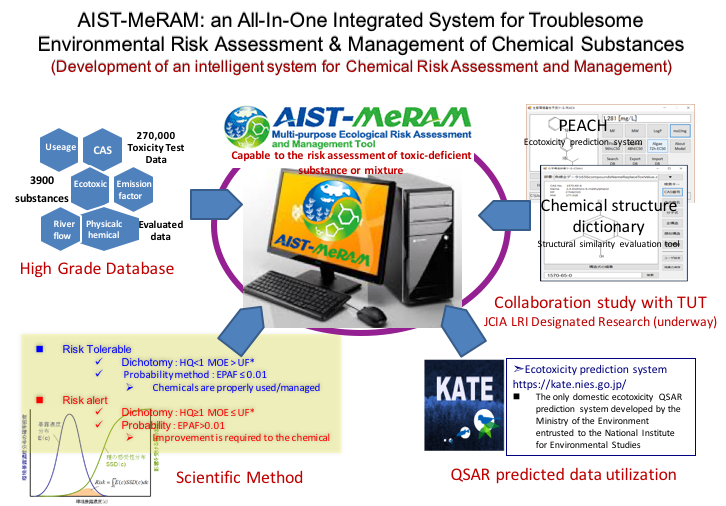 Toward the aim of providing an All-In-One intellectual system for chemical risk assessment and management of chemicals for business operators, Since 2010 we have been developing an intellectual system named AIST-MeRAM, in which the advanced risk assessment technology and huge evaluation data were embedded. AIST-MeRAM is a free and user-friendly software. By installing AIST-MeRAM on your computer, you can perform assessment with only a few mouse clicks – ranging from initial risk assessment to high level risk assessment using species sensitivity distribution and population-level effect models. After releasing Japanese version 0.9.12 in July 2013 and English version 1.0.0 in December 2014 as the first public version respectively, we released the completed version of AIST-MeRAM ver 2.0 (Japanese version & English version) at April 2017. If you are interested, the detailed introduction and the installation program can be obtained for free from the following AIST-MeRAM official site (Japanese: https://meram.aist-riss.jp;English: https://en-meram.aist-riss.jp). However, big issues arise with the current version of AIST-MeRAM (Ver. 2.0) because it is unable to deal with the risk assessment and management of new chemical substances and the existing substances without toxicity information. In order to develop a system that is capable of meeting the concern of the risk assessment and management of all chemical substances, we have been funded as a designated research project of JCIA-LRI from 2016. With the collaboration with Professor Yoshimasa Takahashi of Toyohashi University of Technology and the cooperation with the QSAR ecotoxicity prediction system (KATE) of the Ministry of the Environment, the research outcomes shown in below Figure are expected to be achieved.